Southampton, Pa., USA, September 20, 2017 – Environmental Tectonics Corporation’s (“ETC” or the “Company”) Simulation business unit, located in Orlando, FL, has delivered an Advanced Disaster Management Simulator (ADMS™) system to Montgomery Fire Rescue, in Montgomery, Alabama. The ADMS system was purchased with funding awarded through the Department of Homeland Security’s Assistance to Firefighters Grant (AFG). The ADMS-COMMAND training system will be used to train Incident Command skills to members of the Montgomery Fire Department. 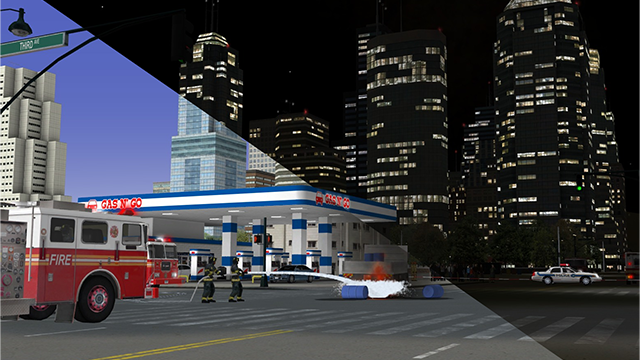 ADMS provides an immersive simulation training environment and will allow for training in many different scenarios, including structural fires, vehicle and aircraft accidents, hazardous material spills, active shooter events, and flooding and other natural disasters where rescue is involved. The system features ETC’s Signature Simulation Technology including the Scene Builder, which allows the user to import custom sounds, images, and videos into the simulation, providing more flexibility with scenario generation. ETC (OTC Pink: ETCC) designs, manufactures and sells software driven products and services used to recreate and monitor the physiological effects of motion on humans and equipment and to control, modify, simulate and measure environmental conditions. These products include aircrew training systems (aeromedical, tactical combat, and general), disaster management systems, sterilizers (steam and gas), environmental testing products and hyperbaric chambers and other products and services that involve similar manufacturing techniques and engineering technologies. ETC’s unique ability to offer complete systems, designed and produced to high technical standards, sets it apart from its competition. ETC is headquartered in Southampton, PA. For more information about ETC, visit etcusa.com.